JPMorgan Chase is making a play for coders and engineers with a new tech space in Manhattan’s Hudson Yards neighborhood. Can you spot Innovant’s FORm_office benching? It’s no longer fashionable to hate the cubicle. The hot new trend is to bash the open office. It seems like every week there’s a new thinkpiece arguing that the trend towards more open- office layouts in American businesses is bad. Not just bad. Terrible. Literally, the worst thing ever. We’re told that open offices cause distractions, reduce productivity, irritate introverts and maybe even spread the flu and other germs. Some of this criticism is grounded in genuine concerns. But at this point, it feels like a lot of these pieces are not accurately describing the ideas behind the open-office movement. Yes, there are bad examples of open offices: free-for-alls with no privacy and no protection against noise and nosy coworkers. But as someone once sort-of wrote, every unhappy office is unhappy in its own way. There are also cubicle farms where workers feel isolated, flexible workspaces with uncomfortable chairs, and even corner offices that feel cold and uninviting. The critics are right about one thing: the open office is not a one-size-fits-all solution for every workplace. Nothing is. Every industry, every company and every department has its own needs and deserves an office design that works for it. Consider human resources. No one thinks that the people who advise staffers on delicate personal situations should do so while sitting in a wide-open space. At the same time, creative types working on a group project shouldn’t be tucked away in quiet rooms where they never interact with each other. The open office works best when it involves small- to medium-sized groups of people who frequently collaborate on projects that require creative thinking. But no office should be 100 percent open–or closed for that matter. There’s always going to be a need for a private office where business deals and personnel matters can be discussed or a conference room where a small group can hash out a new strategy or even a cafeteria table where a couple coworkers can informally trade ideas over tuna sandwiches. The truly effective modern workplace isn’t just a mindless off-the-shelf floorplan based on whatever the hot trend of the moment is. It’s tailored to the needs of that office’s employees. With so many of today’s workers engaged in creative work, that means open offices where people can trade ideas, easily gather in spontaneous group meetings and tell at a glance which of their coworkers are available. An open office also requires a different office style. People who don’t want to be bothered right now should be comfortable putting on headphones without their coworkers taking offense. Companies should also create some flexible spaces where people can go when they need more privacy. And managers should accept that workers may need to sometimes goof off on the Internet to recharge their brain. The open office isn’t for everyone. Some people may never want to work in one. Some businesses may be better with a more traditional layout. And some examples of open offices are no doubt poorly designed and implemented. What businesses and organizations alike should consider is the idea of a modular office with versatile furniture. An office should be designed in a way that you can create a certain layout when you need it. Sometimes privacy is necessary, but there are times when having an open-office layout that fosters collaboration makes sense. Office design isn’t an all or nothing. 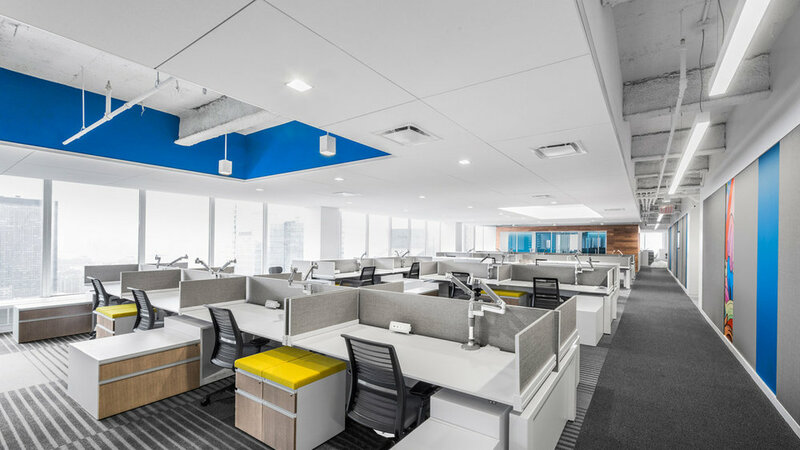 Under one roof a company can have some traditional offices, a few cubicles, a conference room, and some open-office space where its employees can work collaboratively. It doesn’t have to choose an open-office plan or not. It doesn’t have to decide to have a traditional office design or not. But bashing the open office is getting a little too easy. It’s not destroying the workplace or trapping America’s workers on the dark side, and it doesn’t need to die. Originally published on The Huffington Post, February 2015.